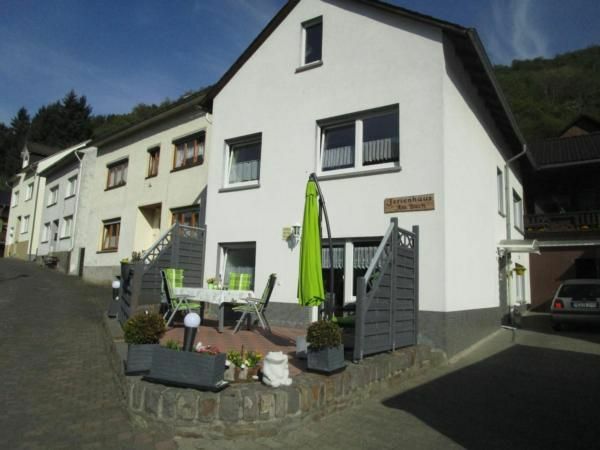 Our cozy and comfortably furnished holiday home is located in a quiet side Rhine valley in the heart of the romantic Middle Rhine and UNESCO World Heritage, 1 km from the Rhine. Thus, an ideal location for exploring the many castles and monuments in the Rhine Valley. Oberdiebach is a small village with about 800 inhabitants and beautiful old half-timbered houses. The Gothic parish church St. Mauritius, built in 1330, is also worth a visit. Wineries offer the typical local Riesling wine. Hiking trails in and around Oberdiebach with commanding views to the valleys, to the ruin Furstenberg and on the Rhine, invites you to walking and hiking. The "Rhine castles' trail runs directly behind the house. A special attraction is the trail to the, in an open pasture landscape living, Exmoor ponies. For our little guests there is a nice playground near the house. Not far from Oberdiebach (about 2.5km) is Bacharach with its historic old town. From here, there are many opportunities to explore the World Heritage Site Upper Middle Rhine Valley. For example, with a boat trip along the many castles, towards the famous Loreley rock. Or up the Rhine in the direction of Bingen / Rüdesheim. The beautiful bike path along the Rhine, which can be reached by Oberdiebach out in 5 min., Invites to bicycle tours with many attractions and breaks at the beautiful Rhine beaches. The Rhine Valley offers a variety of hiking trails with beautiful views. On the doorstep we have the "Rhine castles' trail. Right bank of the Rhine runs the famous hiking trail "Rheinsteig". Bingen can be reached by car in 15 minutes. Here you have the opportunity to travel by ship to the other side of the Rhine, and to visit the charming wine town Rüdesheim with the famous Drosselgasse. For families worth visiting the 13km distant High Wildlife Park Hunsrück. Also the 15km distant Kletterwald Lauschhütte ensures adventure. Leisure pools can be reached in 10-15km distance. From July to September, the fireworks spectral "Rhine in flames" takes place in several cities in the Middle Rhine Valley. Nice home in a small village just up from the Rhein. Very well equipped. Spotlessly clean. Spacious and comfortable. Parking at the front door. Very well located for exploring Rhein vineyards and villages from Koblenz to Rudesheim. Owners are next door. There was a “pantry” set up where the owners had provided a variety of daily groceries and even local wines and jams for sale at reasonable prices. Great if you are arriving late or when you hadn’t had a chance to hit a market. Internet was moderately reliable in the living room. Het huis ziet er keurig netjes uit. Alles is af tot in de kleinste details. Ook de eigenaren die langs het huis wonen zijn super aardig en zijn behulpzaam. Wir haben unsere Zeit im Haus von Fam. Straßburger wieder sehr genossen. Das Haus ist liebevoll gestaltet, sauber und komplett mit allem ausgestattet. Wir haben uns sehr wohl gefühlt. Das Haus und die Vermieter waren top. Wir haben uns sehr wohl gefühlt. Ich habe noch nie so eine tolle Einrichtung gesehen. Die Vermieter waren stets zur Stelle bei Fragen und anderen Anliegen. Wirklich toll!! Ganz große Empfehlung!!! Oberdiebach is located in a Rhine side valley, nestled between vineyards and green slopes, has about 800 inhabitants and beautiful old half-timbered houses.